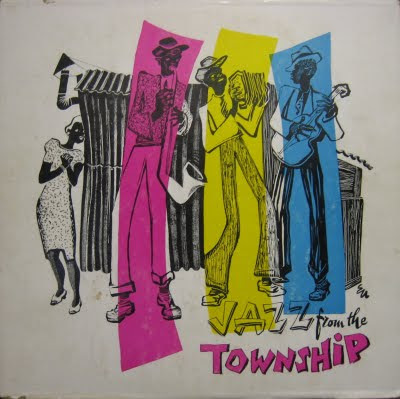 A delightful and historically important compilation of early fifties township jazz - close-part harmonies, yodelling cowboy Tim Mkize, the Lo Six, Havana Swingsters, a little penny-whistling, and a great Dolly Rathebe track from the 1949 movie “Jim comes to Joburg”. And how about the sultry voice of Martha Mdenge – phew! (Read Janet Suzman on Martha Mdenge here). The absence of a date anywhere on this publication is not inconsistent with the patronising otherness of the sleeve-note author. 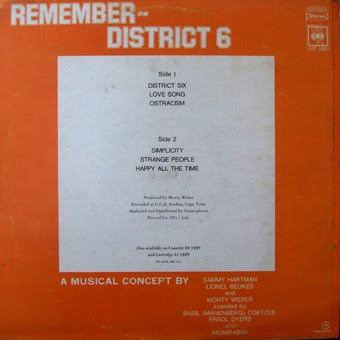 Simultaneously detached from the creators but intimately engaged with their products, there is an informed commentary on each song – my guess would be that this compilation was targeted to catch the ‘temporary’ wave of British audiences who were queuing to see the touring production of King Kong. 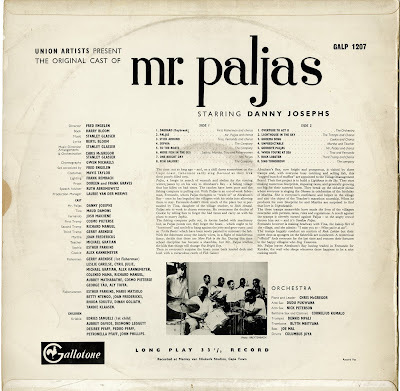 Perhaps the record companies did not see the need for a date as they did not foresee any sustained international interest in African music? How wrong some of them still are. 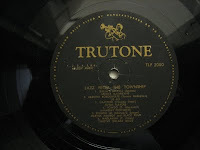 Thank you Jonathan Eato in York (UK) for sharing this vinyl. 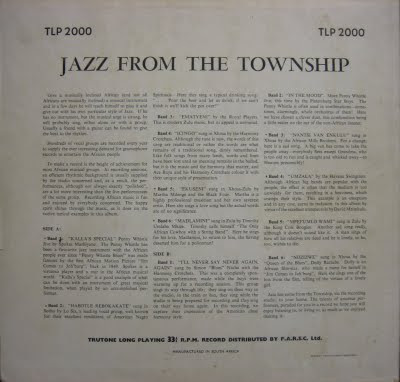 Jonathan is in the process of developing the Jazz in South Africa (JISA) research pages - have a look. 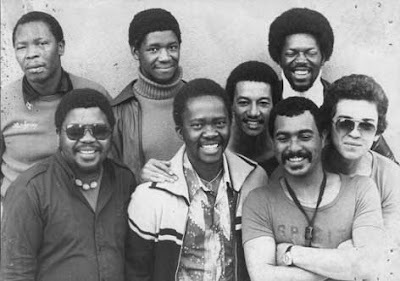 For many the seminal Afro-Jazz fusion group formed in the musical laboratory that was the Pelican Nightclub in Orlando, Soweto. 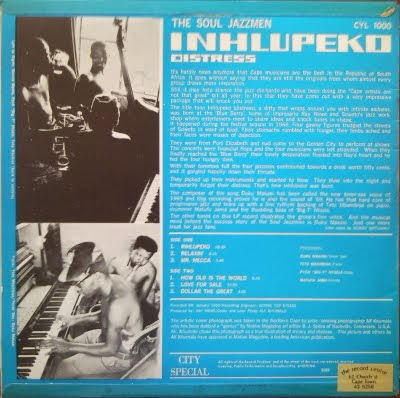 Criticised at times for being too intellectual this band was the genesis of Sakhile, Stimela and the individual careers of Bheki Mseleku, Mervyn Afrika and others. 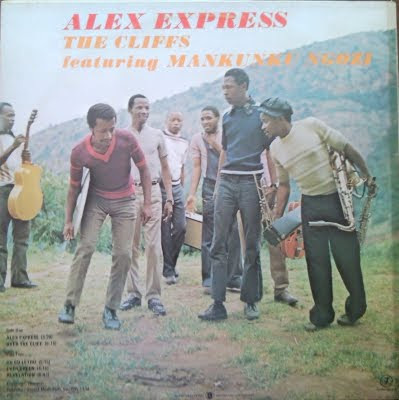 A re-issue was planned by David Mark's 3rdEar label just before the passing of Sipho Gumede but current discussions apparently revolve around remixing the original LP and excluding certain tracks. ElectricJive brings you the original LP and a bonus 45. Enjoy whilst it is still out of print. 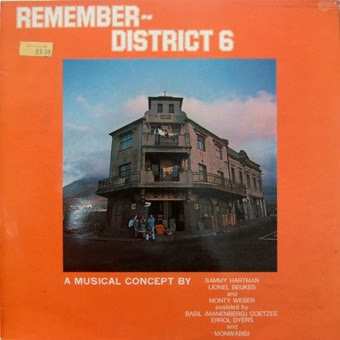 Chris McGregor and Stanley Glasser team up here to bring us a 1962 musical story of dwindling fish stocks, lonely wives, and ‘bergies’ (tramps) being appointed to run the Village Management Board. The tramps start levying outrageous taxes on the villagers so they can build a ‘lighthouse in the sky’. Funny thing how the subject matter of so many musicals can always seem relevant, no matter how dated the music may feel and where you may live. Stanley (Spike) Glasser was also musical director of King Kong - he wrote some of those songs too. Glasser left South Africa for England in 1963 and was Professor and Head of Music at Goldsmiths College, University of London from 1969 to 1991. He retained close links with the country of his birth and studied the music of the Pedi and the Xhosa people. Adam Glasser – Stanley’s son – is an accomplished jazz harmonica player, having recently released an African-jazz album entitled “Freedom at First” – which features Pinise Saul on vocals. It really is well worth getting hold of a copy. You can find out more about it here. 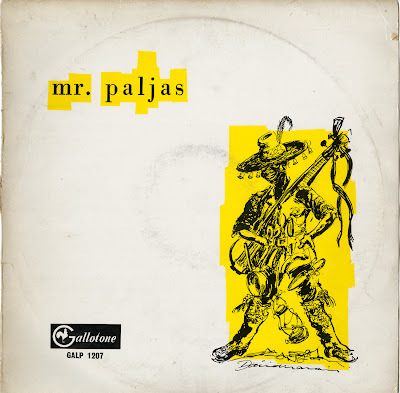 This recording of Mr Paljas was very kindly made available to EJ through artist and collector extraordinaire, Siemon Allen. If you have not seen his installation of Miriam Makeba records (amongst other wonders), that is another web-visit worth making. Siemon tells us that, in the near future he will be setting up a website for an archive of South Africa audio at http://www.flatinternational.org/. In the interim he can be reached at http://www.siemonallen.org/. Thanks Siemon for sharing! Now here is a special and rare musical treat with a topical message for today’s times. Phiri is Barney Simon’s African “Volpone” – a 1972 musical about the richest people and the poorest people in Soweto. Add Wally Serote to the co-writing team, and then mix four months of intensive musical composition input from Mackay Davashe and Cyril Magubane (Heshoo Beshoo Group - who will appear on EJ) … and then bring in a stellar band with three of the Heshoo Beshoo Group, Mackay Davashe and Barney Rachabane… and you have a cracker of a production. 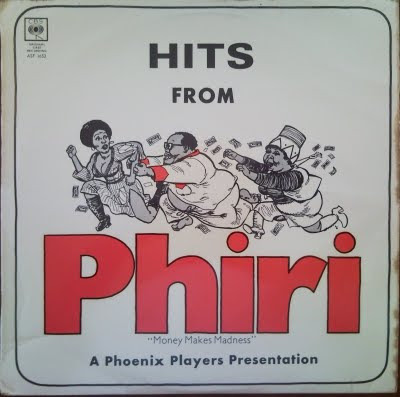 Phiri is the richest and most mischievous villain and swindler in Soweto. He pretends to be on his deathbed, desperate for a wife and heir to his riches – attracting a long line of people bringing bribes to Phiri’s side-kick Mutla to win the favour of becoming the heir. Wealthy shebeen-queen Mamabele (Sophie Mgcina) is pregnant and decides she is tired of ‘having bastards’, and a half-dead man suits her fine. Phiri’s plan is to have his will read at his coffin – leave everything to Mutla – and then to leap out of the coffin and chase all the expectant bribers away with a sjambok (whip). The plan misfires when Mamabele brings a police sergeant to the reading of the will. Phiri stays in the coffin in fear of the trouble he will get into – and later has to run off to one of the homelands, while Mutla shares Phiri’s wealth with the people on the street. You can read more about the basic plot of the original 1606 Ben Johnson play “Volpone” here. Jazz great Winston Mankunku has died in Cape Town. The masthead photo of ElectricJive (above) features Mankunku centre-stage on his soprano saxophone playing at the Langa Town Hall in 1972. It was taken by Ian Huntley, a long-time friend and supporter of this great musician. Mankunku had been ill for months, staying with family in Atlantis. 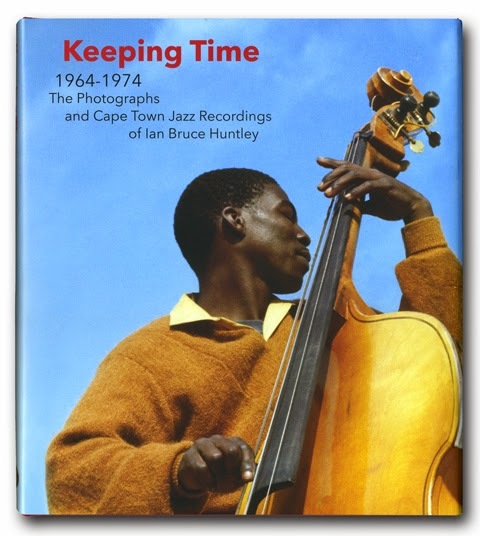 Born in Retreat in Cape Town in 1943 Mankunku leaves a huge legacy to the world of jazz. The Ngozi family was uprooted from their home and relocated to Gugulethu under the Group Areas Act in the early 60s. John Coltrane was Mankunku's greatest source of inspiration and his respect and admiration for "Trane" endured throughout his career. Ian Huntley recalls many car journeys with Mankunku in the backseat where he would play multiple ongoing looping variations of "My favourite things" as they drove to and from gigs. We in KZN were blessed in the 1980s to witness his special talents when he gigged at the Rainbow in Pinetown and at Eddels in Pietermaritzburg - on the same day! In 1968 Mankunku recorded the famous Yakhal'Nkomo album together with Early Mabuza, Agrippa Magwaza and Lionel Pillay. 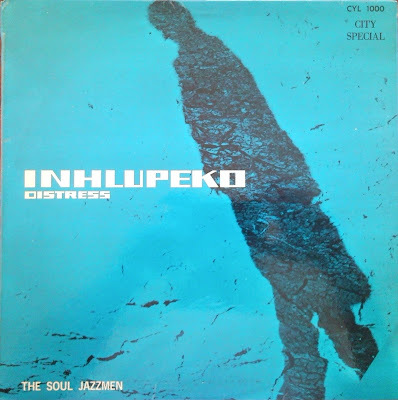 Although he received the Castle Lager "Jazz Musician of the Year" in the same year, and despite the fact that the album sold well, Mankunku received little of the royalties. 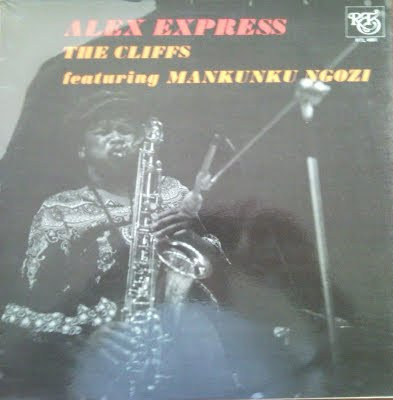 In celebration of this great musician's contribution to enriching all of our lives, we share this rare and funky 1975 recording of Mankunku with The Cliffs - Alex Express. King Kong may be among the most well known South African musical theatre pieces, but it is not the only one. Here at EJ we are happy to admit a limited knowledge of this phenomenon – but that does not mean we cannot share a few of these rarities with you. 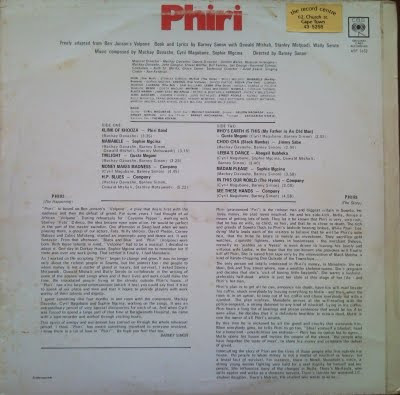 Over the next while we will share three we have lined up – Busang Meropa (1989); Phiri (1972) and Mr Paljas (1962). Busang Meropa (Bring back the Drums) is a South African play written and directed by Maishe Maponya, and was first produced at the Birmingham Repertory in 1989. A number of Maponye’s plays fell foul of the apartheid authorities. Maponya founded the Bahumutsi ("Confronters") Drama Group in 1976 "to reflect in drama the struggle of the people of South Africa". This group was mostly based at the Moravian church hall in Diepkloof, Soweto, but did undertake a number of European Tours in the 1980s. Sounds from Bahumutsi is an offshoot of the Bahumutsi Drama Group. Backing vocals: Nomthemba Mdini; Nomvuyo Mahabehlala; Aubrey 'Ops' Matonyane'; Sydwell Yola; Dan Tlouana; Maishe Maponye; Zenzi Mbuli. 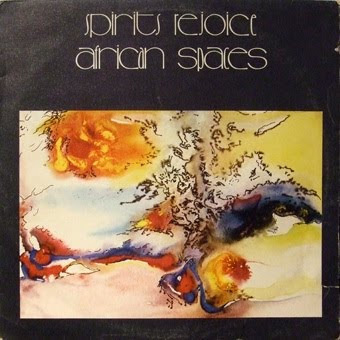 Recorded in South Africa and mixed at The Point, London. Here's a real treat for South African jazz fans. 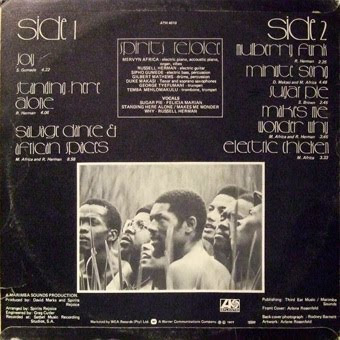 Tete Mbambisa and Duku Makasi in this 1969 studio recording. Very rarely seen on eBay and mostly only gathering dust on collectors shelves. Enjoy!